The Mursi tribe and many others have lived in southern Ethiopia for centuries. Their religion is referred to as "Animist". They believe that there is no distinction between themselves, animals, plants or rocks. Everything has a soul. Nature is deeply revered. 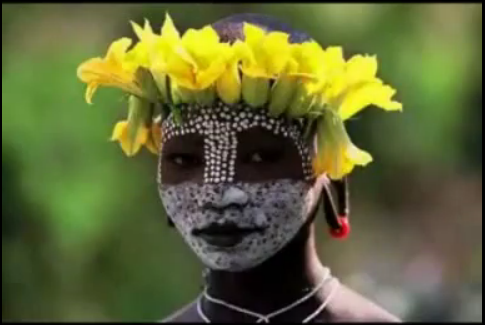 This may explain why there unique expression of body art blends seamlessly into their environment. Artists like Picasso, Motherwell and Rothko believed that primitivism was the core of creativity because it conveyed the soul of a person. Abstract Expressionist art was based on the non-intellectual. It was all about revealing your inner expression directly on the canvas. Sadly, these tribes along the Omo river are slowly being forced out by the Omo National Parks. Government officials have coerced the Mursi to give up their land without compensation, making them squatters on their own land. Now there is a community tourism project helping the Mursi to declare their territory a community conservation area. You can go to www.mursicommunity.com. OOPS ON THE OMO PEOPLE!